Throwholics is posting their top 10 innovations in the throwing world. And I thought you might like to read/watch them too. I have added a few more videos and photos to their text for your enjoyment. Thanks for reading and thanks THROWholics! Find and follow Throwholics on facebook and twitter. Throwing innovation № 9 was the inclusion of women in throwing events. It is interesting to reflect back and remember that until the 2000 Sydney Olympic Games, women did not participate in hammer throw at the highest profile competition of Athletics. 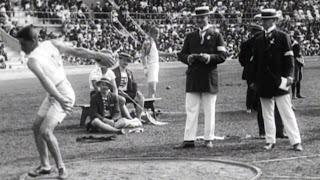 Furthermore, women were included in the other three throwing events at the Olympics after men, as follows: Discus 1928, Javelin 1932 and Shot Put 1948. The inclusion of women into the throwing events has definitely improved the profile of throwing sports. The women are top-level athletes, and exhibit highly proficient technique in their events. Even more exciting, due to the recent inclusion of women in hammer throwing, we are seeing world records matched or pressured consistently at the big events. Anytime world records are being set, it spikes the interest of the general public and makes for great storylines leading up to major competitions. For these reasons, the inclusion of female throwers is my № 9 throws innovation. Of course, there are downsides to this method of information sharing. Young throwers may look at the training of top throwers, and attempt to copy their training exactly. This is a bad idea, which will most certainly lead to overtraining and discouragement for the young athlete. Furthermore, some posted information may be unreliable in terms of improving performance for most throwers. Again, trying to emulate these points may cause issues in the young thrower’s progression. Despite these facts, it is better to have access to information, than to be stuck in isolation and not exposed to the vast amount of help available from the great community of throwers. For this reason, social media is the number 6 innovation in track and field throws. My number 3 innovation is the new style javelin. In 1986 the sport of javelin was changed forever. Before this time, a javelin was used which flew tremendously far (World Record of 104.80 m (343’10’’) held by Uwe Hohn), but was associated with numerous negative incidents. Issues were arising due to the distance the javelin traveled and the way it was landing. The javelin was getting perilously close to reaching the track on the other end of the stadium, making it dangerous to throw at the same time as track events occurred. Furthermore, due to the center of gravity location of the old javelin, it was typical for the javelin to land flat, and not stick into the ground. This made obtaining accurate distance marks nearly impossible for the judges. The solution? The IAAF would keep the weight the same but tweak the location of the centre of gravity of the javelin (the centre of gravity was moved forward 4 cm), such that the flight path of the javelin would be changed forever. The new javelin does travel a shorter distance than the old javelin (World record of 98.48 m (323’1’’) held by Jen Zelezny), however, the tip now sticks into the ground instead of landing and skipping along the grass. This has allowed for the javelin to maintain its location in the stadium, where it can be safely performed during other events. Furthermore, with the tip of the javelin now consistently sticking into the ground, judges can record accurate distances. Due to the drastic change to the throwing implement enacted by the IAAF, the new men’s javelin is the number 3 throwing innovation. This number 2 innovation may be viewed as a cheat by me, since really it encompasses two major technical advances to the sport of shot put. The first technical enhancement to shot put was the inclusion of a glide before the release of the shot put. Introduced by Parry O’Brien in the 1950s, he was the first the first person to begin the throw facing the back of the circle. Using this technique, Parry broke the world record numerous times, and was the first person to throw the shot over 60 feet (18.29 m). The glide technique has maintained its popularity, with many of the world’s top marks in the last decade coming from this technique. In the 50s and 60s we saw the development of the rotational throw as well. Again, earlier throwers with this technique (Chandler, Ward, Malek, Oldfield and so on) achieved outstanding results with this technique (Bartonietz). The biomechanics behind this technique are generally accepted to be more complex than that of the glide, and so learning this technique requires a more complex set of instructions to athletes (Bartonietz). Also, the introduction of two unique techniques has created a sub-plot to world-class competitions. Undoubtedly, at every competition you will have members of the unofficial ‘glide team’ competing against the ‘rotational team’. Furthermore, if you talk to enough coaches, you will find people who love one technique over the other, and will get into debates about which technique is superior. Finally, it is easy for the general public to decipher the difference between the two techniques…and to choose a favorite technique to cheer for. Because these two very different techniques, produced around the same time, are able to both produce world championship winning throws, the shot put techniques are the number 2 throwing innovation. And now, the number 1 throws innovation. When I search the literature on throws training, one means of training stands out above all others in terms of efficacy and popularity: training with heavier and lighter than competition implements. Many top coaches such as Babbitt and Bondarchuk have advocated for the effectiveness of including different weighted implements in training. It is widely accepted that heavy implements increase the athlete’s strength for the throwing movement. Conversely, the lighter implements are used to increase speed during the throwing movement. Some critics may advocate that the use of heavy and light implements negatively affect the rhythm of throwing movements. However, the outstanding distances athletes throw using this training means cannot be ignored. Because throwers of all levels and disciplines can benefit from the use of heavy and light implements, this training means is the number 1 throws innovation.